There is only one centre for kabuki in Japan and that is the Kabuki-za in Tokyo. This is rather as if the RSC were the only purveyor of classical drama in the English-speaking world. It is no wonder that most Japanese, while they have heard about kabuki, have actually never seen it. The Kabuki-za always offers two programmes every month, one beginning at 11am and another at 4:30pm, each four to five hours long. This may seem excessive but one must remember that kabuki plays of the classical period were anywhere from 10 to 15 hours long. As a consequence, one virtually never sees a performance of a complete play, even when, as happens every February with the KANADEHON CHUSHINGURA, both matinee and evening are devoted to two parts of the same play. The matinee this time was taken up with the GENJI MONOGATARI, a play from the 1940’s in modern Japanese based on the famous 10th-century novel of Lady Murasaki. I have seen plays of this type, called “shin-jidaimono” (plays written in the Western style but set in the pre-Meiji period) and have found them very disappointing, since they forego all of the purely Japanese elements that make classical kabuki so different from Western drama. As the woman at the ticket counter said to me, “It’s not ‘Shibaraku’”--referring to one of the “18-best” classical kabuki plays. I therefore chose the all-classical evening programme. Besides being less esoteric than noh, kabuki is made more accessible by the institution of English-language earphone guides. As the play progresses, a kind voice tells you not just the gist of what is happening but also points out features unique to kabuki and to the specific work seen. Most of my knowledge of kabuki comes from 18 months of listening to this kind of detailed commentary. Being Japanese does not automatically make one understand kabuki as is evident by the large numbers of people who rent the Japanese-language earphone guides. Bunraku, when held at the National Theatre in Tokyo, also provides a similar earphone guide service. The evening programme this month was typically well-organized as a survey of the different styles of kabuki. First was “Jushuko”, the Incence Burning Scene from Act IV of HONCHO NIJUSHIKO (The 24 Examples of Filial Piety) by Chikamatsu Hanji written originally as a bunraku play in 1766 before being taken up (as was common) by kabuki. Second was the dance play MOCHIZUKI based on the noh play of the same name by Saami Yasukiyo (the author of Fuji below). Last was quite a rarity--MIYAKODORI NAGARE NO SHIRANAMI (The Courtesan and the Slave Trader) written in 1854 by Kawatake Mokuami (1816-93), the last of the classical kabuki playwrights. This play was especially interesting as a glimpse into how kabuki was developing just prior to the opening of the country to the West in 1868, an event leading unfortunately to the decline of kabuki as a living art form. “Jushuko” is one of only two scene of HONCHO NIJUSHIKO that is still performed. Sometimes such excerpts work well on their own, but other times, as in this case, one feels one has just got involved in the plot when the excerpt ends. The rationale for this particular excerpt is that the role of Princess Yaegaki is considered the most difficult of the “three great princess roles” in kabuki because of the sustained level of intense emotion required. Yaegaki begins the scene burning incense and chanting sutras before the portrait of the husband she believes is dead. Her mourning changes to confusion when she sees that the new samurai in the household looks the same as her supposedly dead husband. After wavering over the impropriety of such an action, she throws herself at the young man, who, not wishing his true identity revealed, repulses her, thus sending her into a state of self-reproach. As new information arrives, the samurai’s female confidante persuades him it would be best if Yaegaki knew he is in fact her husband, this fact sending Yaegaki into joy, only to be checked when it is learned that two assassins have left to kill him. Here the excerpt ends. “Jushuko” was chosen to highlight the younger generation of kabuki actors, with Shinnosuke as the samurai and Kikunosuke in his first essay of the role of Princess Yaegaki. Almost all the most important scenes of kabuki depend on the actor communicating the intensity of of repressed emotion. A classic example would be the various scenes of “kubijikken” (head inspection) when a man must examine the severed head of an enemy, sees that it is really that of his own son, but must suppress his reaction so that the others around him do not notice. Totally unlike Western drama where shouting, cursing and ranting seem to be the only means of expressing great emotion, kabuki encourages the actor to show this emotion only in silence through the imperturbable mask of his face. Keeping this in mind, I felt that Kikunosku just did not have enough intensity. The audience seemed to think so too, since he received no “kakegoe” (shouts of the actor’s house name in appreciation) even in the character’s famous pillar-holding pose. Both Shinnosuke, who had very few lines, and the famous Tamasaburo Bando, in the lesser role of the confidante, had much more presence. MOCHIZUKI was more satisfying since in one act it told the conclusion of a story. Kabuki plays based on other genres show their origins in production. Since HONCHO NIJUSHIKO was derived from bunraku, “joruri” (ballad) singers were present on a platform at house right just as they would be for a puppet play. Since MOCHIZUKI was derived from noh, the musicians and chanters were placed across the stage with the actors and a stylized pine tree painted in the wall behind them. This particular play was being performed in honour of the one-year anniversary of the death of Mitsugoro Bando IX by his son Yasosuke and grandson Minosuke. In the play, an innkeeper (Yasosuke) helps a widow (Kikugoro) and her young son (Minosuke) avenge the death of her husband and his former lord by killing his murderer Mochizuki (Danjuro) who also happens to be at the inn. The inn-keeper’s plan is to introduce the widow and her son as entertainers and to ply Mochizuki with saké until they can take their revenge. Each character performs a dance (with chanted accompaniment) relevant to their real situation. Once Mochizuki has been killed, the actor exits (as per tradition) leaving the three avengers to pose in triumph over his hat left on the floor. The main delight in this play was undoubtedly seeing the 10-year-old Minosuke flawlessly execute his role including his rather complicated dance. May happened to be the month of the Dankikusai (Danjūrō-Kikugorō Festival) at the Kabukiza in Tokyo's Ginza, commemorating the outstanding achievements of Danjūrō Ichikawa IX and Kikugorō Onoe V, the two giants of kabuki theatre. 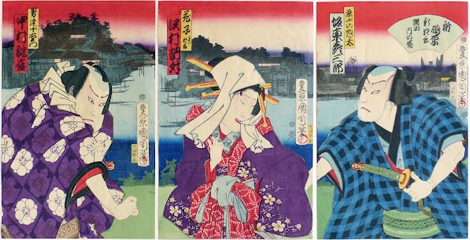 One of the rarities revived to highlight their talents was Miyakodori Nagare no Shiranami (The Great Thief of the Miyakodori Brothel), written in 1854 by Kawatake Mokuami (1816-93), the last of the classical kabuki playwrights. The play, cut to only two-and-a-half hours, was especially interesting as a glimpse into how kabuki was developing just prior to the opening of the country to the West in 1868, an event leading unfortunately to the decline of kabuki as a living art form. What was specially fascinating about this play, is how, even during Japan’s two hundred years of isolation the subject matter of their drama should have take the same course as drama in the West. In both cases, the serious drama of the 17th century concerns primarily the aristocracy and their problems but shifts by the time of the 19th century to an interest in the lower echelons of society including the poor, the disadvantaged and the criminal. This play by Kawatake, like the other three I have seen by him, has a marvellously complex but engrossing plot that could be by Balzac or Dickens with elements of the supernatural thrown in for extra excitement. The play, also known as Shinobu no Sōta, is based on the real-life “Yoshidaya incident” in which a boy named Umewaka Yoshida was kidnapped by a human trafficker called Shinobu no Sōta and later dies on the banks of the Sumidagawa River. It is categorized as a shiranami-mono, a subgroup of 19th-century kabuki kizewa-mono whose heroes are romanticized bandits. I cannot possibly summarize the action, but I must say it contains one of the most unique roles in all of kabuki. As I have mentioned, all roles in kabuki are played by men just as they were in Shakespeare’s day. Those who specialize in women’s roles are called “onnagata” and in men’s roles “tachiyaku”. It is very rare for an actor to win acclaim in both, but Kikugorō (who played the widow in Mochizuki) is one of the few. The role is a tour de force, for the most intriguing figure of the play is the last of the Yoshida clan, the male Matsuwaka, who to avoid detection and plan his revenge, disguises himself as the courtesan Hanako, who is also the head of an infamous criminal gang. When Hanako is at ease with members of her/his gang, we have the highly unusual scenes of an actor dressed in full “onnagata” regalia dropping his falsetto “onnagata” voice and reverting to the voice and posture of a male. This was certainly a new one on me and the audience seemed to be as surprised as I was. Danjūrō was excellent as always, this time as the faithful, blind retainer of the Yoshida clan who, when his sight is later miraculously restored, seeks death at the hands of Hanako/Matsuwaka, for having accidentally killed his brother. The play concludes with a parody “tachimawari”, when Matsuwaka and his servant (also Danjūrō), all the while calmly eating their dinner, also fend off the onslaught of twelve policemen – a delightful conclusion to a fascinating play. Illustration: Ukiyo-e of the characters Shinobu no Sōta, Hanako wa Matsuwaka and Jūemon in Miyakodoru nagare no shiranami. ©1873 by Toyohara Kunichika.